Simple design that goes the distance. A while back I came across some fantastic forced perspective street art while doing some client research. These works were not only created on a fairly grand scale but the degree of difficulty is just off the scales. This sort of work takes a lot of patience, foresight, skill and talent. While the research I was conducting had more to do with a blending of classical art with the grunge of street art – it never occurred to me how much potential this kind of perspective art could have in a design context – especially in terms of signage and branding applications. 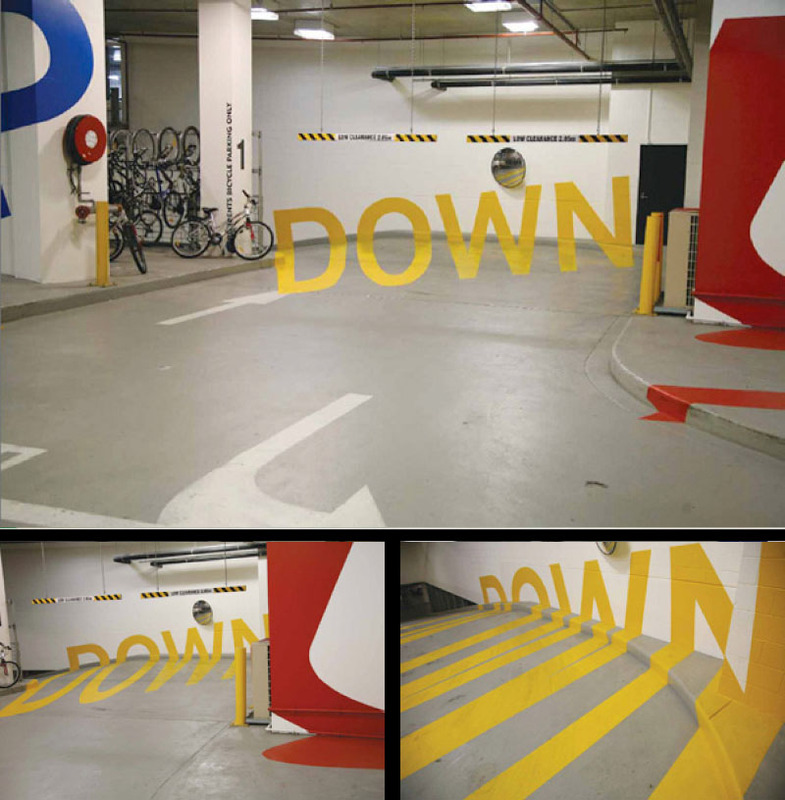 Here is a design concept for parking garage signage in Melbourne, Australia that uses this simple approach to create powerful and evocative imagery. This is a relatively dated piece (2008 by Axel Peemoeller) so it’s nothing too novel today but surprisingly, I don’t think I have come across anything else like this since then. While the design concept above was quite unique and interesting – it wasn’t 100% effective in my opinion. This sort of approach requires the typography to be seen from a specific angle for it to read properly. And since cars will be moving all the time when travelling through these ramps, that perfect perspective will only be seen in a small window of a few seconds. Anyway, I may just be nitpicking but I do believe it still works because the messages are relatively simple and the graphics are on a large enough scale for people not to grasp on. So what have I seen lately that I think is working in the perfect context for this type of graphic design? Our very own Toronto Raptors’ homecourt. This is quite new to me, but its apparently old news in the European sports world. Regardless, the Toronto Raptors are the first NBA organization to use the following “3D technology” for their baseline wordmark. New or not, I think this approach works much better in this context then that of a car park simply because the viewpoint is controlled and consistent for television broadcast. If it’s your first time seeing this too, then you’ll definitely catch yourself doing a few double-takes when you see players, refs, basketballs, etc pass over the banner.